Hoorah! Roebuck Bay Working Group has produced an inspiring booklet on local coastal plants. Coastal Gardens – A Planting Guide for Broome provides advice on growing a waterwise garden that benefits your wallet and Broome’s coastal waters. The book is online and suitable for smartphones. The local coastal plants (endemics) in the book, thrive in Broome soils and climate. Most are cyclone resistant, require less water than introduced plants and resistant to tropical pests. Local coastal plants have defence mechanisms to cope with common pests, thereby require fewer pesticides than introduced species. Less pesticides used in your garden, means less chemicals entering Broome’s coastal waters via roadside stormwater drains. 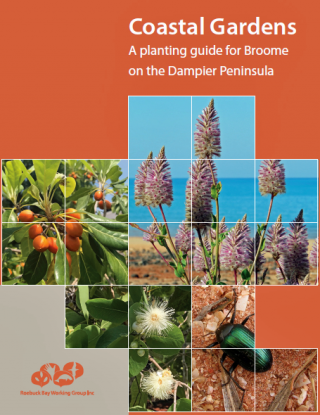 The book also includes the plants to avoid – with many of the weeds we see in Broome, escaped garden exotics. This project is funded by State NRM with support from Royalties for Regions and Rangelands NRM through funding from the Australian Government’s National Landcare Program.